After two years in hiding, Angela Taylor knows her independence is worth it. As long as she can escape her past, she has everything under control. Until a flash flood hits the park where she works, and hot Chris Forrester shows up the exact moment she needs a hero. Chris proves he can save lives-and weaken a girl's knees. But how can she make him understand that she's off-limits, that getting close to her will endanger his life? Her happiness or his safety: it shouldn't even be a choice. Tricia: Welcome, Rachel. Can you tell us about your most recent release? 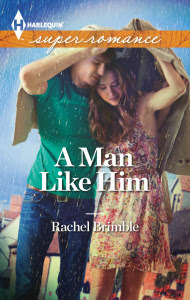 Rachel: My most recent release is “A Man Like Him” which is book two in my ongoing series with Harlequin Superromance. The books are set in the fictional UK town of Templeton Cove. The idea for “A Man Like Him” was inspired by the real life and terrifying experience with my family in 2010 when we were caught up in the French floods. We were trapped on a hotel roof for over 12 hours and eventually rescued by helicopter – how could I not write a romantic suspense novel based on that?? The opening chapters of the book give an almost hour-by-hour account of what happened. I LOVED writing this book! Rachel: Ooh, difficult question! I suppose I would like readers to start my Harlequin series with “Finding Justice” which is book one. As I’ve now contracted a total of five in the series, it would be ideal for a reader to get to know the recurring characters from the beginning––the books are stand alone too though. Also, if readers like Victorian romance, I am writing a series for eKensington that started with “The Seduction of Emily”. Since its release (Feb 2013), I have written “The Temptation of Laura” (Feb 2014) and contracted two more. The books are set in the late 1800s and take place in and around Bath, England. Tricia: What was the most challenging aspect of writing your books? Rachel: I always struggle with plotting and the dreaded ‘sagging middle’ – my books are around 85-90,000 words and once I get to 40,000 the flow seems to ground to a horrible halt. The only way for me to get through it is to keep writing and then worry about cleaning it up during the following drafts. Characters tend to change and misbehave…this causes the author the most inconvenient amount of stress, lol! Rachel: To give my readers such a great read that they come back for more! More than anything writers create characters and books they want to read and fall entirely in love with the cast and their emotional journeys. If readers love the books too, the joy that brings is inexplicable. Of course, making a living from what I LOVE to do would be the ultimate cherry on the cake! Rachel: I am currently writing book 4 in my Templeton Cove series for Harlequin Superromance – this will be a Christmas 2014 release. I am just emerging from the ‘sagging middle’ and loving it. The heroine took me a while to get to know during the writing of this book but the hero arrived fully-formed and ready to go. Thus is life! Rachel: Keep going! There is very little advice published authors can give other than to keep your fingers to the keyboard. There are also some great and affordable online courses that I used avidly when I was starting out. Writing is a craft and it can be learned – with tenacity and belief, sooner or later an agent or publisher will want your work. Guaranteed! Rachel lives with her husband and two young daughters in a small town near Bath in the UK. After having several novels published by small US presses, she secured agent representation in 2011. In 2012, she sold two books to Harlequin Superromance and a further three in 2013. She also writes Victorian romance for Kensington--her debut was released in April 2013, with book two coming in Feb 2014. Their eyes locked and Chris’ gaze dropped to her mouth. It fell ajar and her tongue poked out to wet her bottom lip. He snatched his gaze back to the sky. They were in the middle of a disaster situation. They were reaching out to each other for support. Nothing more. Nothing less. So why the hell was his heart beating like a damn jackhammer? Without thinking, he pulled her into his arms and she buried her face into his chest. He brought one hand to the back of her head, the other to the small of her back and pulled her close. She fit the contours of his body like she was meant to be there.